After ERP Cloud Connect, it was the turn of Microsoft with its Cloud strategy. Mr. Srikanth Karnakota, Director - Cloud Strategy, Microsoft made an energetic presentation about the potential of Cloud with more focus on the Indian SMB segment. He pointed out that from his experience, he observed that cost proposition plays a major role in the Indian market as compared to the Cloud paradigm in the case of adoption of Cloud computing in India. He stated that the Independent software vendors often face the problem of lower margins and revenues. He suggested that System Integrators should look at focusing on specific verticals and capitalize on them to grow non-linearly. He pointed out the example of Mahindra Satyam with its strong focus on Media and Entertainment sector. He also stressed upon the necessity of choice in the case of platform companies. He brought in great conceptual clarity when he brought out the differences between the various *aas offerings. Although I have read several long winding documents on the differences between PaaS, SaaS & IaaS, his presentation made it so simple, yet elegant.He explained the differences in simple terms which went like this. He also brought about the difference between Virtualization and Cloud Computing. He iterated ( several times actually) that Virtualization is only an incremental step in the evolution towards cloud computing. Often it is the first step. 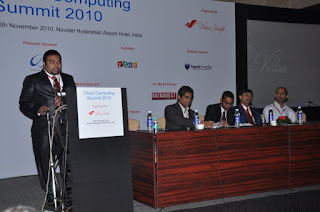 This was followed by an interesting panel discussion on the Cloud Computing and Telecom sector. 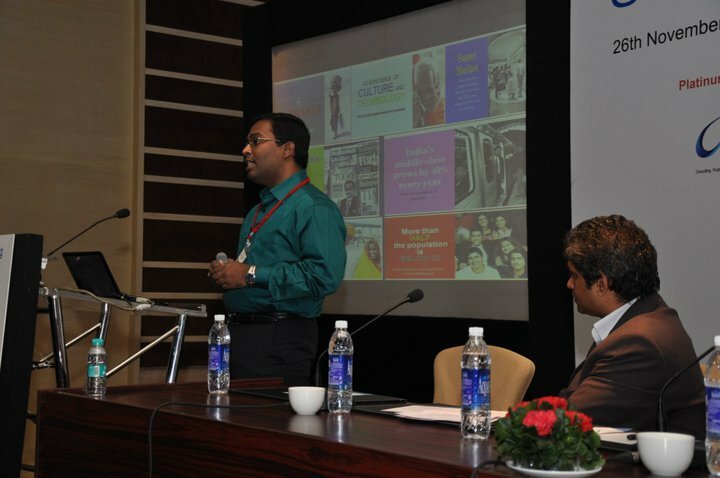 Pranay Mishra, CTO - Vice President, MTS moderated the session. 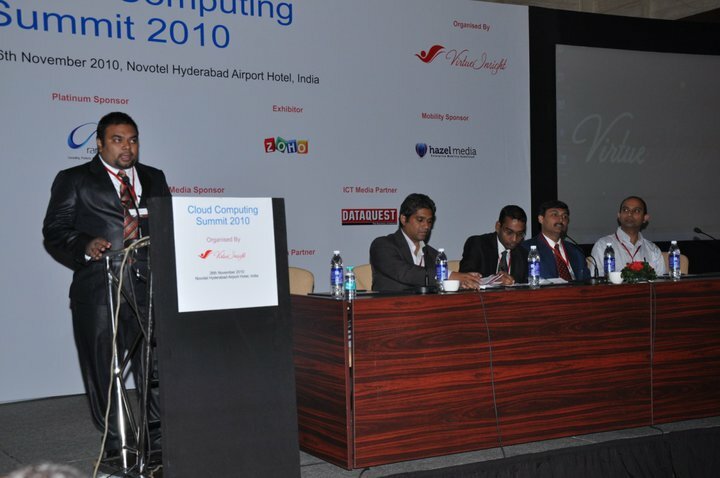 The panelists included Uttam Kumar, Head - New Technology Innovation, Aircel, Ashwin Jaiswal, Head IT- Telecom, Media, Ent. Practice & IT Consulting, Binu Raj,Sr. Director, Engineering - Yahoo and Laxmi Narayan Rao of JamCracker. While Network Intelligence has been going rounds in technology circles, it is not finding its adequate use with several companies being reluctant to collaborate and share. The panelists shared the common sentiment that the major shift in connectivity would bring about powerful apps in lesser powerful phones, thus bringing out an seamless experience for all users, powered by ubiquitous connectivity. Laxmi Narayan Rao brought about an interesting analogy and compared the adoption of Cloud Computing with the advent of Net-banking in India. He pointed out the current insecure attitude towards Cloud Computing, similar to the way people perceived Net-banking few years ago, would gradually phase out with gradual acceptance amongst the industry. However, the audience were quick to spot the flaw in this analogy, as the net banking with its strict governmental regulations cannot be compared in this case with the Cloud computing, as often in this case, there exists a tripartite agreement between the parties. Few of the audience also brought up the issue of liability and indemnification of the data. The panelists noted that these security issues and regulations are being evolved everyday with advancements in the industry. One of the panelists compared the Blackberry imbroglio, with its legal complications in India, with Singapore which had brought about strict regulations which allow the monitoring of data that are transmitted through the secure networks. One of the panelists pointed out that SSL encryption is not possible in Blackberry, which turned out to be the major area of concern. The panelists agreed that the aggregator and the last mile provider are the most vulnerable players in the entire chain when it comes to the security issues. Binu Raj from Yahoo candidly admitted that he had a team inside Yahoo which was called as the paranoid team, whose responsibility was to look sceptically at the major developments happening in the technological front and look at the security issues that would creep up. One of the panelists also looked at the various possibilities that are coming up in the enterprise segment which always seem to be running behind the consumer segment when it comes to innovation. One of the panelists wondered if we would get to see soon an Enterprise based Apps Stores for SMBs and SMEs.